PeaFactory is an open source encryption tool that produces small programs for specific encryption purposes such as encrypted notebooks or file encryption. here called PEAs (Password Encryption Archives). A PEA is at the same time a program to decrypt a certain selection of files as well as a program to display the content (Image Lock PEA, Calendar Lock PEA and Notebook PEA) and also a kind of key file. To be easily handled, PEAs consist of a single file, a (Java) jar archive. Why does a program have to be produced? Why are programs not directly offered? 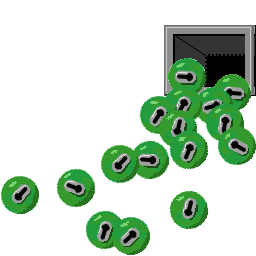 Producing the PEAs offers two advantages: The key file property of the program can be realized by writing a 32 byte randomly chosen value (a salt) inside the byte code of every single PEA, and although you can choose between several cryptographic primitives in the PeaFactory, the PEA itself contains only the chosen ones and is therefore relatively small. Producing a PEA is a small extra effort that needs to be done only once. The produced PEA can be handled then like any other encryption program. To achieve greater security, use PEAs with the key file property, divide PEA and content and store them on different places. Store for example the content in the cloud and the PEA on your hard disk. Depending on your settings, you can also produce PEAs that behave like other password encryption tools: You can decrypt and open any content with any of these PEAs (with the same cryptographic primitives). File Lock PEA: Encryption of files and folders. These files are encrypted and decrypted by your password on the hard disk. 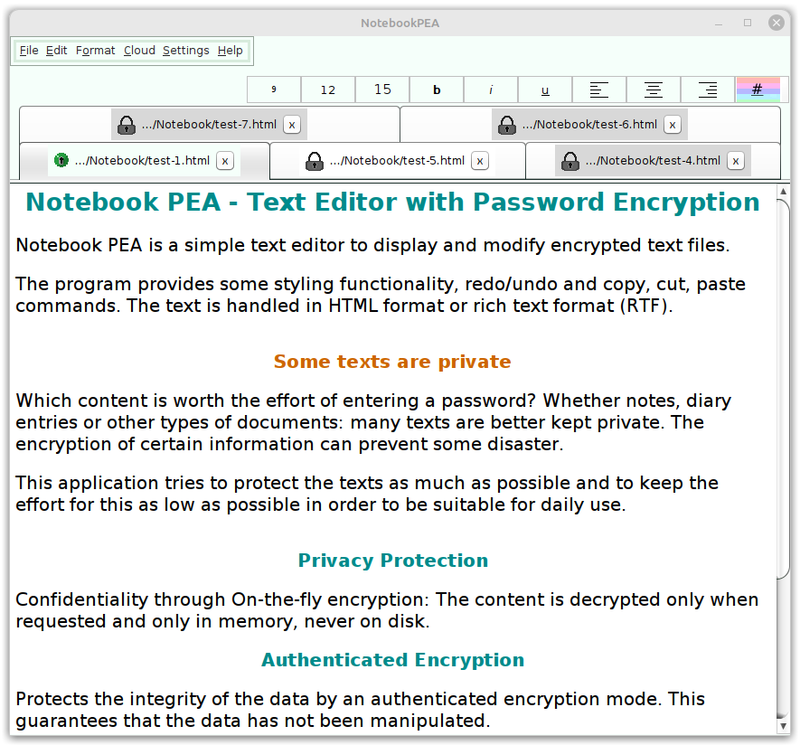 Notebook PEA: Encryption and display of one text. In contrast to file encryption, the text is never stored unencrypted on the hard disk but exists only in the memory (RAM). Notebook PEAs are self decrypting archives (SDAs), you do not need another program to read the text. There is also a simplified notebook available without most of the functionality. Image Lock PEA: You can encrypt images, which are displayed in an embedded image viewer. Like texts, Image Lock PEA is a self decrypting archive, the images are never stored unencrypted on your hard disk. Calendar Lock PEA: Displays calendars in a monthly, daily and weekly view. Like for texts and images, Calendar Lock PEA is a self decrypting archive, the calendars are never stored unencrypted on your hard disk. PeaFactory is actually in beta stage and is still insufficiently tested. Use the PeaFactory with caution.